Announcing VANITAS: a new journal of poetry, writings by artists, criticism, and essays. VANITAS will come out annually, a forum for international voices with an emphasis on coming to grips with current world situations. Each issue will contain writings by artists whose primary modes are non-literary and will feature the work of a visual artist. This artist will contribute text and images in a color insert, in addition to an image designed for the magazine’s cover. 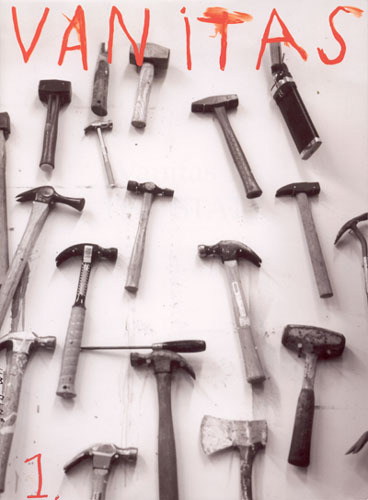 The first issue of VANITAS, released in June, 2005, features poetry by Charles Borkhuis, Daniel Bouchard, Michel Bulteau, Elaine Equi, Clayton Eshleman, Drew Gardner, Nada Gordon, Richard Hell, Fanny Howe, Ann Lauterbach, David Lehman, Judith Malina, Sarah Manguso, Carol Mirakove, Ange Mlinko, Nick Piombino, Carter Ratcliff, Morgan Russell, Jerome Sala, Marianne Shaneen, and Anne Waldman. There are essays, critical texts, and other writings by Ricardo Abramovay, Martin Brody, Alvin Curran, Jordan Davis, Carter Ratcliff, and Morgan Russell. Nada Gordon writes the first “Word” piece, in which a word chosen by the editor is examined by a writer in whatever way she or he chooses. A short text by Francis Ponge is translated by Laird Hunt. Jim Dine is the first issue’s featured artist. In addition to the cover image, Dine has created the logo and numbering that will be used on all future issues of VANITAS. Dine contributes a selection of his recent color poem photographs, as well as two new, handwritten, poems, and two short texts. VANITAS is edited and designed by Vincent Katz. It is distributed by Small Press Distribution. Katz also edits Libellum books, chapbooks thathighlight longer poems, essays, lectures, and other writings that might have a hard time seeing the light of day. For more Information, write to VANITAS: 211 West 19 Street, #5, New York, NY 10011, or vanitas@el.net. You can also check out their web site at www.vanitasmagazine.com or selections from Issue 1.